If credit card companies had it their way, consumers would charge any and every purchase they make every single day of their lives. Unfortunately, that would only be fun until it came time to pay the enormous bill. While it can be difficult to resist temptation from time to time, there are a few excellent reasons to put your cards away and refrain from making another purchase on credit. One of the first things children are taught is self-control. Because of this, many children grow up to be disciplined, responsible individuals–until they are given a credit card without understanding how to use it sensibly. All of a sudden, with this promise of “buy now pay later” self-control is thrown out the window, and the impulse buying commences. Not only does this impulsiveness make it more difficult to maintain control over other areas of your life, but it’s also a great way to rack up debt fast. Instead of being tempted to take yourself on a nice vacation or on a shopping spree that you can’t afford, remind yourself that self-control pays off. Yes, shopping on credit is fun at first, but when it comes time to buy a house or a new car, and you’re so in debt that you can’t afford it, you’ll regret every dollar you spent on a frivolous purchase. Making purchases on credit could also mean that you’ve broken your budget. Every consumer needs a budget, and they should stick to that budget every month. This is the best way to make sure that your bills are paid and that you are building your savings account. If you are making purchases, even small ones, on your credit card, then you are exceeding that budget. Each time you use your credit card, you are borrowing money, and that money needs to be paid back with interest included. If you need to borrow money to make a purchase, then either you don’t need the item in the first place or you need to re-calculate your budget and come up with the cash for it. Another good reason not to use your card is because it’s expensive. Each time you make a purchase and can’t pay it off by the end of the payment period, you’ll be charged interest and other fees. If you only make the minimum payments on your credit card every month, it can take years to get out of debt (20+ years). Each time you consider making a purchase on your credit card, ask yourself if it’s really worth the extra money you’ll have to dish out. Plus, when you carry a balance from month to month, your interest rates can increase. While that 0% introductory interest rate may be tempting, it’ll end up costing you if you can’t afford to pay your balance in full each month. After the introductory period is over, your interest rate, as well as payments, will increase. Also, if you’re short on funds one month and make your payment late, the interest rate may go through the roof because of that. If your balance is high, your minimum payments may become more than you can afford. It’s true that identity theft is on the rise and is only going to get worse when so many people just reach for their credit cards instead of paying with cash. Some identity thieves focus on getting your credit cards and maxing them out before you even realize they’re missing or what just happened. No one is immune to identity theft, but armed with a little knowledge about how identity thieves operate and you can stay one step ahead of them. Take a look at all bank and credit card statements each month, if possible review at least once a week. Another good reason not to use your credit card is when you are nearing or have exceeded your credit limit. It’s important that you check your statements every month to see where you stand. Checking your statements can keep you from exceeding your credit limit. Even though the CARD Act ended the policy of automatically enrolling customers in over-limit programs that charged steep fees, it still can be embarrassing to have your card rejected at the cash register when out shopping. If you get a notice that your interest rate is about to go up, that’s a good sign to stop using that credit card. Although the CARD Act of 2009 says that credit card companies must give you 45 days’ notice before your rate goes up, there’s a quirk in that law. The new rate actually applies to purchases starting on the 14th day after you got the notice. 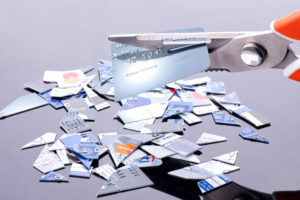 This is the time to negotiate with the credit card company to plead for the old rate, and if that doesn’t work, then it’s time to stop using that credit card. Some consumers become frustrated with using credit cards all the time. Most people pay substantial late fees and penalty fees, or they are very unfortunate and become victims of identity theft. Some individuals find that keeping track of and monitoring their charges and credit card bills is just too hard and too time-consuming. It can be easy to develop credit card fatigue when you depend so heavily on that little piece of plastic. When it comes to your personal finances, it’s always better to exercise caution. While it’s easy to rely on credit cards, doing so can lead to serious debt accumulation and financial troubles. In order to put yourself in the strongest financial situation possible, avoid using your credit cards unless absolutely necessary or when you know you can pay off the full balance that month. If you need help managing your credit card debt, Advantage CCS can help you. Our Non-Profit credit counseling service is available online, via the telephone, or in person to help you work out a game plan and get your finances back on the right track. Contact us today! The call is completely free and always confidential. There are no obligations, we’re here to help!